Incised ‘Πo’ mark to base of ecuelle. This is an early and ambitious example of the Nove factory, located near Bassano in Northern Italy. 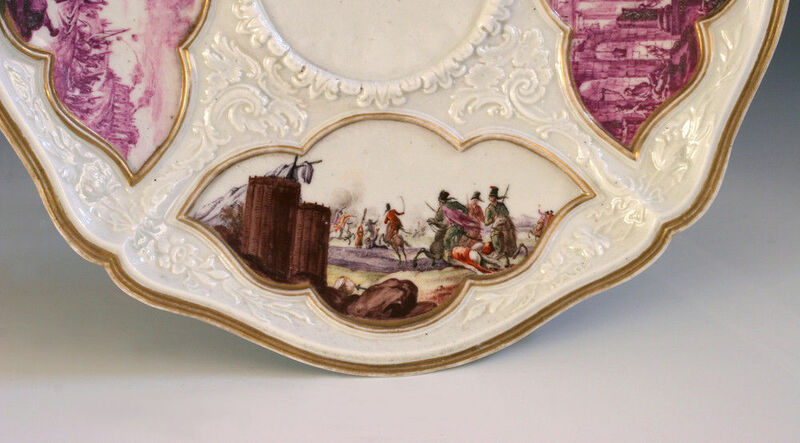 Each piece is decorated with four alternating shaped moulded cartouches painted in puce monochrome and a rich polychrome palette with classical figures and battle scenes in landscapes. Between the cartouches are relief rococo scrolls, the rims and cartouches with bands of gilding. 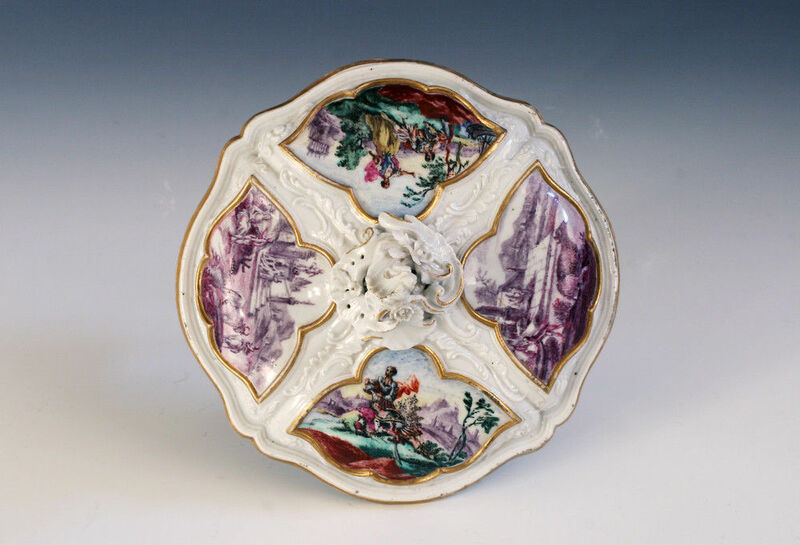 A small number of wares with this elaborately scrolled rococo relief were made at the start of the factory before they adopted the neo-classical style for which they are best known. A teapot in the Victoria and Albert Museum is illustrated in Italian Porcelain, by Arthur Lane, pl. 30A, and another in the Museum fur Kunst und Gewerbe, Hamburg, illustrated in L’arte della Porcellana in Italia, by Alessandra Mottola Molfino, fig.243 are of this type. 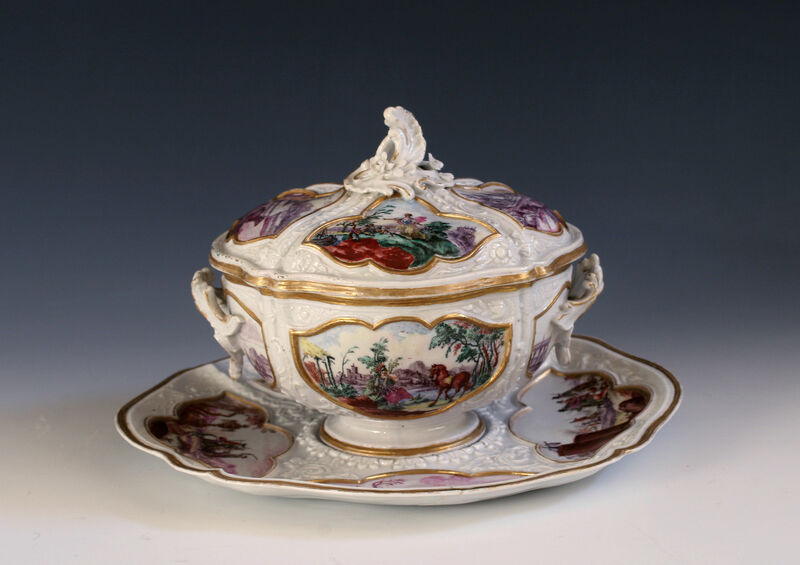 Arthur Lane quotes (p. 22) the Giornale d’Italia of 1765 which had notices of Antonibon’s porcelain which included ‘superb teapots in low relief of masterly execution’. This is apparently the only porcelain example of this form recorded. Sold to the Metropolitan Museum, New York.